15 hours of detailed, high quality MP4 and Windows Media Video Excel 2016 Training Videos. Excel 2016 Core (77-727) and Expert (77-728) Exams: Our Excel 2016 training videos include all the training you need to pass! In-depth, high quality, easy to follow Microsoft Office Excel 2016 training videos developed & trained by Microsoft Certified: Specialist, Expert, Master & Microsoft Certified Trainer, Kirt Kershaw. 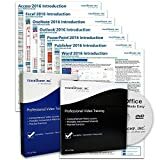 With 160 training videos and 15 hours of training offered in MP4 & Windows Media Video formats you will have everything you need to master, or if desired certify in, Excel 2016. Excel 2016 Training Videos will introduce you to the basics of creating a: spreadsheet, with simple formulas and calculations to more powerful ones, and how you can use Excel 2016 as a database with many sorting and filtering options. It's also important to know how to create the database by watching the top design flaws. Learn how to create charts from your organized data, how to format your data range into a nice looking table, and more by our Microsoft Certified Trainer! "These training videos gave me the knowledge and confidence to land my dream job. In tough economic times such as these it's essential to have valuable skills to bring to a job interview. Having very strong MS Office skills is a must have for any decent CV (change this to resume if you like) to stand a chance in today's job market. My investment in this training has paid for itself several times over on day 1 of starting the job - Thank you!" "I have looked for a lot of options for learning Excel and this is the best I have found. The narrator voice is clear and with good rhythm, which is very important in instructional videos." Save 50% Now! 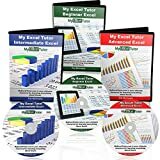 Get the best selling Microsoft Excel course for beginners intermediate and advance on sale while you still can. This complete Microsoft Excel training program teaches you everything you need to know to learn excel even if you've never used Excel before today. This is a complete Microsoft Excel tutorial training on DVD. Physical and Digital Version. Your complete package comes with 3 DVD's. A beginner Microsoft Excel training, intermediate Microsoft Excel training, and advanced Microsoft Excel training. You get the keyboard shortcuts and list of Microsoft Excel Formulas. You also get the digital version of the training so you can go through 100% of the training on your favorite iphone ipad tablet pc computer or digital device. Instructions for the digital version come with your package. Learning Microsoft Excel Does not have to be hard or take a lot of time. 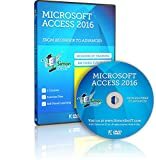 In this 3 disk set you will learn how to use Microsoft excel 2016 2013 the easy way. Watch over our shoulders as we take you through this Microsoft Excel video tutorial. Don't read it...Watch it. By watching the Microsoft Excel video tutorial with audio you get get to follow along and start using Microsoft Excel 2016 like a pro in no time. Just think what knowing how to use Microsoft Excel will do for you. In addition, we give you 100% money back satisfaction guarantee. So what are you waiting for? You have nothing to lose and everything to gain. Just hit the Add To Cart button to get your Microsoft Excel Training starting now. 4 COURSES TO UPDATE YOUR IT SKILLS: Whether you want to update your IT skills for work or for personal development, this Simon Sez IT training course can help you achieve your goal. The self-paced training DVD includes 4 courses for Excel 2016, PowerPoint 2016, Word 2016, and Windows 10. PUT THE THEORY INTO PRACTICE: After you watch the training videos, you can test yourself with some extremely helpful exercises and see if you have understood everything. The training DVD also includes special exercise files that will help you digest all of the new information you learn. 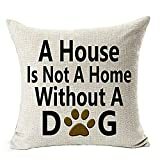 throw pillow throw pillows for couch for bed throw pillow insert 18x18 throw pillow covers 18 x 18 20 x 20 16 x 16 cases set. pillow covers geometric pillow covers solid floral striped paisley moiré checkered patchwork plaid print gingham cushion case pillow covers decorative standard king size pillow covers 26x26. throw pillows throw pillows cover linen cotton blend faux fur linen blend velvet bedding cover. Note:Please allow minor error due to manual measurement.Due to the difference between different monitors, the picture may not reflect the actual color of the item. Learn Microsoft Office 2016 & 2013 with this Deluxe training package from TeachUcomp, Inc. Mastering Microsoft Office Made Easy features 809 video lessons with over 42 hours of introductory through advanced instruction on both DVD-ROM to play on your PC or Mac and via online with your web browser for one year (with enclosed Online Key Code). In addition, you'll get our seven Introductory Quick Reference Guides- printed, laminated guides with step-by-step instructions in the most critical functions (24 pages and 375 topics). Pop in the DVD-ROM or open the downloaded version to watch, listen and learn as your expert instructor guides you through each lesson step-by-step. During this media-rich learning experience, you will see each function performed just as if your instructor were there with you. Reinforce your learning with the text of our fifteen printable classroom instruction manuals in PDF (Introductory, Intermediate, and Advanced), additional images and practice exercises. This complete Microsoft Office course covers the same curriculum as our classroom trainings and was designed to provide a solid foundation in Office. This package also includes an optional practice exam with evaluative feedback, an optional final exam and a Certificate of Completion when you pass the final exam- for each of the seven courses included. Test your knowledge after completing the course and demonstrate your proficiency. Whether you are completely new to Microsoft Office or upgrading from an older version, this course will empower you with the knowledge and skills necessary to be a proficient user. We have incorporated years of classroom training experience and teaching techniques to develop an easy-to-use course that you can customize to meet your personal learning needs. 2019 HIPAA Omnibus Rule Complete Compliance Package is designed for medical offices, psychology, chiropractic, dental, assisted living facility, pharmacy ... All healthcare settings! This easy-to-understand step-by-step package will provide you with all the comprehensive compliance materials that includes the (5) essential components HIPAA Privacy Auditors will request: 1. HIPAA Manual written to Omnibus Rule Standards / Final Rule 2. Portal Access to Required Ready-to-Use / Updated Forms: Patient, Employee, Business Associate Agreement Forms 3. Portal Access to HIPAA Employee Training Video / HIPAA Employee Certification 4. Portal Access to HIPAA Required Report Templates: Risk Assessment Report & Data Back Up & Contingency Plan Report 5. HIPAA Checklist of Facility Requirements. This is a comprehensive, easy-to-navigate program providing everything you'll need to be fully HIPAA compliant! The manual is written in easy-read style with "fill-in-the-blanks" format regarding your facility specifics. The video training can be used with current staff + new hires throughout the year to achieve up-to-date HIPAA Certification. Via a HIPAA On-Line Portal, you will access all required HIPAA Omnibus Rule Forms in ready-to-use Electronic Format. (Microsoft Word and PDF). Includes Updated Business Associates Agreement, Notice of Privacy Practices, Patient Acknowledgement Form, 3rd-Party Medical Release Form, PHI Breach Assessment Form + many more. The Employee Training Video is a 60-Minute informative narrative on Healthcare Facility + Employee Requirements. Comprehensive HIPAA Facility Checklist will guide you and HIPAA Expert help is available. Questions? Contact us via Amazon. Acknowledgement of Disclaimer: HIPAA Made Easy provides legally useful HIPAA solutions but does not give specific legal advice. This item is ideal if you are looking a self-guided solution. We support Amazon return policy of 30 days from date of shipment for unopened and unused products. 75 hrs. of MP4 & Windows Media Video Training Videos: Access, Excel, Outlook, PowerPoint & Word 2016. Certify in: Access (77-730), Excel (Core 77-727, Expert 77-728), Outlook (77-731), PowerPoint (77-729), Word (Core 77-418, Expert 77-725 & 77-726). Developed & trained by Certified Microsoft Office Specialist, Expert & Master & Microsoft Certified Trainer (MCT) and Professional (MCP), Kirt Kershaw. With 665 training videos and over 75 hrs. training offered in MP4 & Windows Media Video formats you will have everything you need to master, or if desired certify in Microsoft Office. **Learn what an Access database is, how to create relationships between tables including the most popularly misunderstood one-to-one relationship, Tables, Reports, SharePoint & more! **Learn how to create Excel spreadsheets including: how to use formulas, calculations, macros, charts & more! **Learn how to create & send emails to individuals & groups, make appointments, create tasks, recurring appointments & more! **Learn to create a presentation with slides, work with templates, videos, make objects come to life & more! **Create documents, templates, cover pages & more! "Kirt Kershaw knocks them dead. Video Trainer Access 2013, simply stated, is the best vehicle I have seen to help users learn the ins and outs of this Microsoft application. Mr. Kershaw is the working definition of a teacher: 1/3 knowledge, 1/3 skill, 1/3 entertainment: he knows his material, is skilled at presenting it, and holds the students interest while doing so." Professor Teaches, the leading brand of training, provides realistic and interactive. 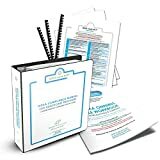 Learn Microsoft Word 2016 & 2013 with this comprehensive course from TeachUcomp, Inc. Mastering Word Made Easy features 193 video lessons with over 7 hours of introductory through advanced instruction. Watch, listen and learn as your expert instructor guides you through each lesson step-by-step. During this media-rich learning experience, you will see each function performed just as if your instructor were there with you. Reinforce your learning with the text of our three printable classroom instruction manuals (Introductory, Intermediate and Advanced), additional images and practice exercises. You will learn how to create basic documents, format text and images, create and use tables, templates, mail merges, macros and much more. Whether you are completely new to Word or upgrading from an older version, this course will empower you with the knowledge and skills necessary to be a proficient user. We have incorporated years of classroom training experience and teaching techniques to develop an easy-to-use course that you can customize to meet your personal learning needs. Simply launch the easy-to-use interface, click to start a video lesson or open one of the manuals and you are on your way to mastering Word.